My first thought: Why did I take so long to read this book?! It has been on my list for so long. It was even on my ‘dying to read list’ and I still didn’t get to it. Well that changed when I became a library convert and was able to check it out. And boy was it ever fantastic. It was everything that I was hoping for. It was well written and kept me guessing and had likable characters. It was all around an excellent book. 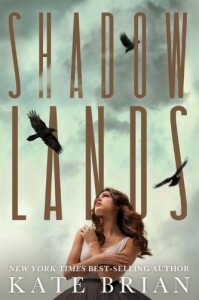 Shadowlands is the first book in a trilogy by Kate Brian. It is the story of Rory Miller who is targeted by a serial killer that has been killing girls for years and getting away with it. However, this time, Rory gets away and now Steven Nell is after her. With no choice but to enter witness protection program, Rory and her family are sent to Juniper Landing where everything seems picture perfect but there is more under the surface than Rory could ever have imagined. Feeling like everyone is watching her all while hiding from a serial killer that may have found her, Rory finds out something that will forever change her and how she lives her life. Have I mentioned how great this book was? I mean really, really great! Rory was a really likable character even though she was a little dull in her life before Juniper Landing. She was more of a homebody which is okay, but hard to make a character interesting that way. But as soon as she was in the new town things were so different for her and that helped add to her. I also liked the relationship between her and her sister Darcy who couldn’t be more night and day. You could tell that no matter what happened between them that they would have each other’s backs, but they would never be the most bestest of friends because they were so different. But through that difference there was a connection and I attribute that to Brian’s writing. Besides the characters the story was awesome. It really kept me guessing the whole time even though I had a feeling I knew where it was going. From one point in the book on I thought I had the whole thing figured out and then a new scene would happen and I would question myself completely. It really was nice to read a book that was able to make me second guess myself over the predictable ones I feel I have been reading. There was enough mystery to keep my intrigued but enough facts to truly believe I knew what would happen. I know this review is brief and doesn’t give away much but that was on purpose as I don’t want to ruin the mystery and the fun for anyone. Just know that Kate Brian has crafted an interesting series that I have read nothing similar to. It has great characters and a solid plot and you should really not be like me and wait to read it. I’m already excited to get to the second book. Love!